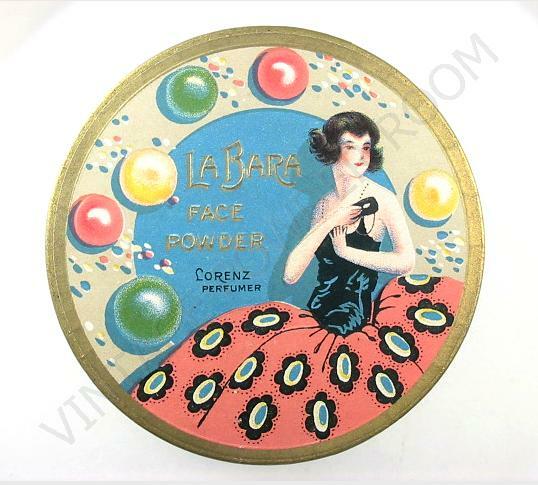 The woman on the LA BARA face powder box (c. 1920s) appears to be posing for a picture in the midst of a celebration — perhaps a New Year’s Eve party. 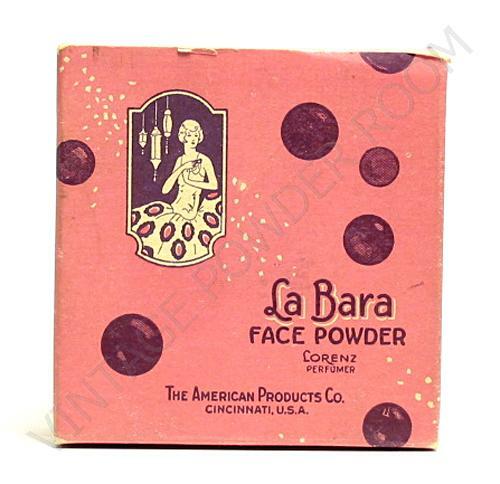 The gaiety of the box speaks volumes about the spirit of the 1920s – it was a decade of parties. 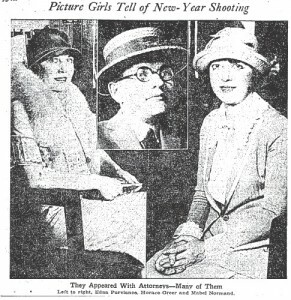 There was at least one infamous New Year’s Day get together during the 1920s that ended in a shooting, rather than in a mere hangover. 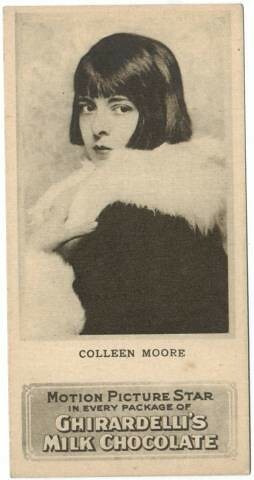 It was the first day of 1924 and two of the most famous actresses in Hollywood, Mabel Normand and Edna Purviance, had joined wealthy Denver oil man Courtland S. Dines for afternoon cocktails in his apartment at 325-B North Vermont Avenue. 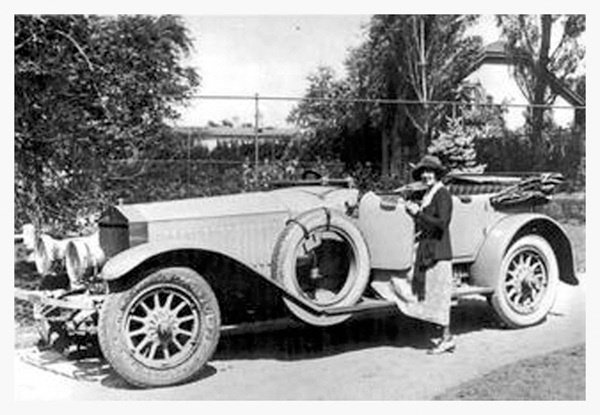 Mabel Normand’s chauffeur, twenty-seven year old Horace A. Greer (alias Joe Kelley) arrived at Dine’s apartment at around 7 pm stating that he’d been called to pick up Miss Normand and take her home. For whatever reason, Greer was under the impression that Mabel was being detained at Dine’s apartment against her will. Greer thought subterfuge would be needed to gain entrance to the apartment, so he pretended to be a delivery man. When Greer opened the door to the apartment he said that he saw Dines sitting behind a little table in the living room, and saw Miss Normand half-lying on a davenport. Greer thought that Miss Purviance was in a rear bedroom. Greer later told cops that upon his entrance into Dines’ apartment, he’d announced that he’d come to take Miss Normand home. Despite Mabel’s initial reluctance to depart with Greer, he said that she finally placed her hand on his arm and they started for the front door. Greer said that Dines picked up a liquor bottle and attempted to strike him, presumably to prevent him from leaving with Mabel. Greer reacted by shooting Dines three times with Mabel’s .25 caliber automatic. He’d slipped the weapon into his pocket earlier in the day. Edna Purviance, who said she’d been in one of the bedrooms powdering her nose (an activity of which the Vintage Powder Room highly approves) ran into the living room and found Dines still seated without a bottle in his hand. She declared “There was absolutely no reason for him (Greer) to shoot”. In true Hollywood fashion, rather than phone for an ambulance or the cops, Normand, Purviance, and Greer helped Dines to a bedroom where they undressed him and attempted to give him first aid. They weren’t up to the task — multiple gunshot wounds aren’t something you cover with a band-aid. The shooting occurred at approximately 7 pm; by 8:20 pm Greer had driven himself to the Wilshire police station and turned himself in. Moments after his confession to the desk cop, an ambulance, trailed by police cars, was dispatched to the scene. The cops and caregivers arrived at Dines’ apartment to find him in bed, bleeding profusely and smoking a cigarette. According to news reports Dines arrived at the Receiving Hospital in “a cloud of cigarette smoke and profanity” — hospital attendants were forced to strap the injured man to a stretcher. 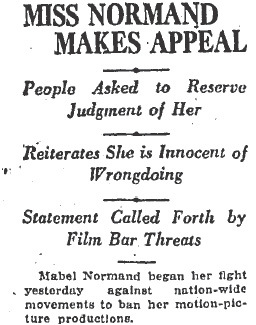 In addition to reporting on the Dines’ shooting, the papers reported on Mabel Normand’s attire. Fans always want to know what a star is wearing, particularly in the midst of a scandal. 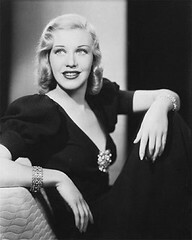 She was, according to the Los Angeles Times, “…dressed in black velvet. She wore two diamond bracelets. In one hatpin were forty diamonds in a cluster.” The LA Times further reported that Edna Purviance was “likewise lavishly attired”. Both Mabel and Edna were described as being highly excited. I believe we can infer from that description that the two women were tipsy. After giving her statement to the cops Purviance was allowed to see Dines. When she entered his hospital room she rushed over to him, threw her arms around him and cried “Oh! Courtland! I love you — please don’t die!” The wounded man assured her that he’d been told by the doctor that he was going to pull through just fine. Barely two years before Courtland was shot Mabel had been embroiled in a legendary Hollywood scandal, the mysterious murder of her pal William Desmond Taylor (a murder which remains unsolved). The shooting of Courtland Dines by her chauffeur was more trouble than Mabel needed. Immediately following Dines’ shooting, Mabel was grilled by cops and interviewed by reporters; all of whom wanted to discover Greer’s motive for the shooting. The best they could come up with was that Greer had been a secret admirer of Mabel’s and when he thought she was in trouble he rushed to her aid. On top of everything, Mabel was scheduled for surgery to remove her appendix the second day after Courtland Dines was shot by her chauffeur. Mabel c. 1916 getting into one of her cars. The good news was that Mabel came through her surgery; the bad news was that the press was having a field day — once again Mabel was making news by being in the middle of a bad situation. Courtland Dines declined to appear in court against Greer. He stated that he’d had so much to drink the day of the shooting that he couldn’t recall anything anyway. Horace Greer refused to testify on his own behalf at his trial because he said he was afraid of hurting Mabel. He said “Rather than hurt Mabel, I’ll take a chance with the pen.” Unfortunately for Mabel, Greer’s attorneys didn’t share his affection for the actress, at least not when they had her on the witness stand. The story they put forward of the New Year’s Day debacle was risqué at best, and at worst it presented a vivid picture of absolute Hollywood depravity. Counsel for the defense characterized the New Year’s get together at Dines’ apartment as a Roman saturnalia — a den of infamy — with the “drunken gladiator” Dines posing on one foot while garbed only in an undershirt! It seems unlikely that Hollywood’s image could have been tarnished any more than it had been over the couple of years prior to Dines’ shooting. During the early 1920s Hollywood scandals had included the murder of William Desmond Taylor, the trial of Roscoe “Fatty” Arbuckle for the death of bit-player and party girl, Virginia Rappe, and the drug-related deaths of stars Olive Thomas, Wallace Reid, Barbara La Marr, and Jeanne Eagels. Without the testimony of the complaining witness, Courtland Dines, the jury took only four hours to acquit Horace Greer of the charges against him. Greer didn’t have much time to celebrate the verdict; he was busted two hours later on liquor charges. Mabel Normand’s film career began to decline; after all she’d been involved in two major Hollywood scandals. During Greer’s trial there were calls to ban Mabel’s films, but she’d already begun to do a bit of damage control through newspaper items. 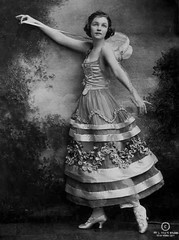 Mabel was popular, talented, and given time she may have survived the Greer scandal, just as she’d done the William Desmond Taylor murder in 1922. 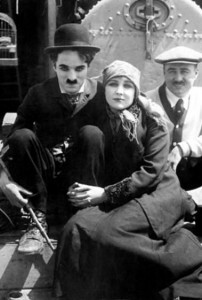 It’s more likely that her career suffered as a result of a recurrence of tuberculosis in 1923. 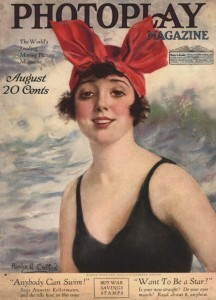 She retired from films and passed away in 1930 at age 37. Edna Purviance had been romantically involved with Charles Chaplin for several years prior to her relationship with Courtland Dines. She would marry neither Charlie nor Courtland; she wedded John Squire, a Pan-American Airlines pilot, in 1938. 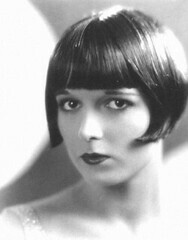 Edna died of cancer in 1958 at age 62. Courtland Dines was 34 years old when he was shot by Horace Greer. He’d spend the next couple of decades acquiring wives, four of them, and a stepson. Dines died of a heart attack at age 55 in his hometown of Denver, Colorado. 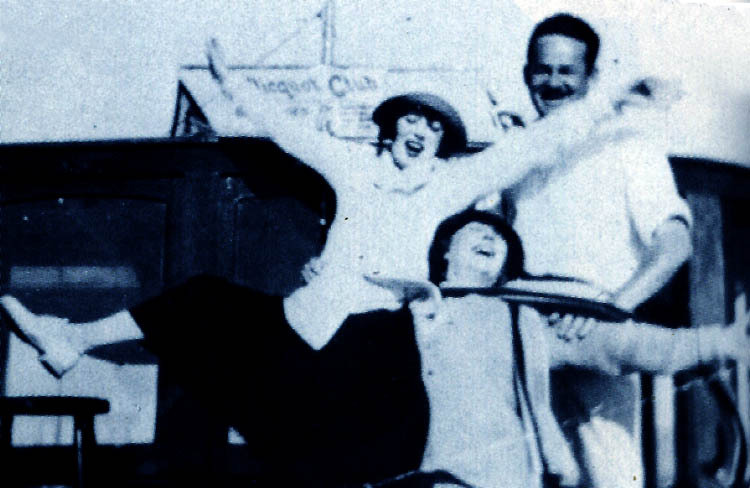 I do hope that you will celebrate the new year with less drama than Mabel, Edna, Courtland, and Horace did! Take care, and have a spectacular New Year! I’ll see you in 2012. 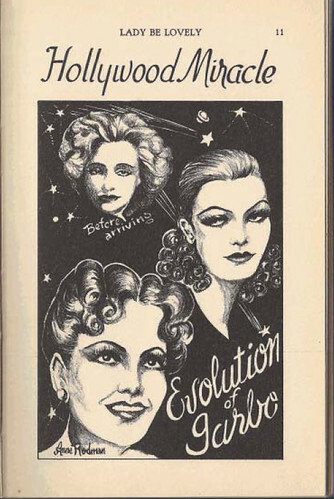 The above drawings represent the “Evolution of Garbo” as interpreted by Anne Rodman in her beauty book, “Lady, be Lovely”. I can’t say that I immediately identified the subject of the drawings as Garbo, but I can certainly appreciate a Hollywood Miracle when I see one. 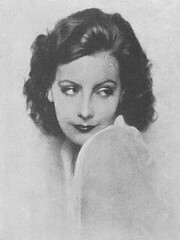 Below is a portrait of Greta Garbo which looks similar to the first of Anne’s drawings. 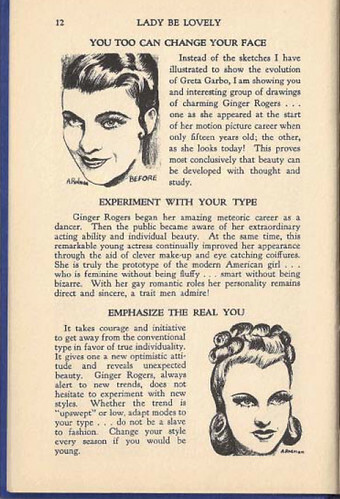 On page 12, Anne Rodman uses Ginger Rogers to demonstrate how women may develop their beauty with “thought and study” and the “aid of clever make-up and eye catching coiffures”. Rodman’s advice makes sense to me — well applied makeup and a flattering hairstyle can make or break a look; but then a couple of paragraphs later she baffles me with the statement “…do not be a slave to fashion. Change your style every season if you would be young.” Huh? Even though I’m obviously confused about what constitutes being a slave to fashion, I agree with Anne’s advice to women that they emphasize their individual beauty. Find your unique qualities and enhance them. In any case, Ginger Rogers managed to develop a look that suited her perfectly, and she dazzled film goers for many years.